Ahead of his attendance at former President George H.W. Bush's state funeral Wednesday, President Donald Trump took to Twitter to express optimism about the state of trade negotiations with China following Tuesday's stock market plunge. "Very strong signals being sent by China once they returned home from their long trip, including stops, from Argentina," Trump said, speaking of China's attendance at the G-20 summit last weekend. "Not to sound naive or anything, but I believe President Xi meant every word of what he said at our long and hopefully historic meeting. ALL subjects discussed!" The president's optimism comes just after a day since he publicly declared himself a "Tariff Man," and stood by his protectionist trade policies even after stocks fell nearly 800 points amid confusion over the result of Trump's meeting with Chinese President Xi Jinping. 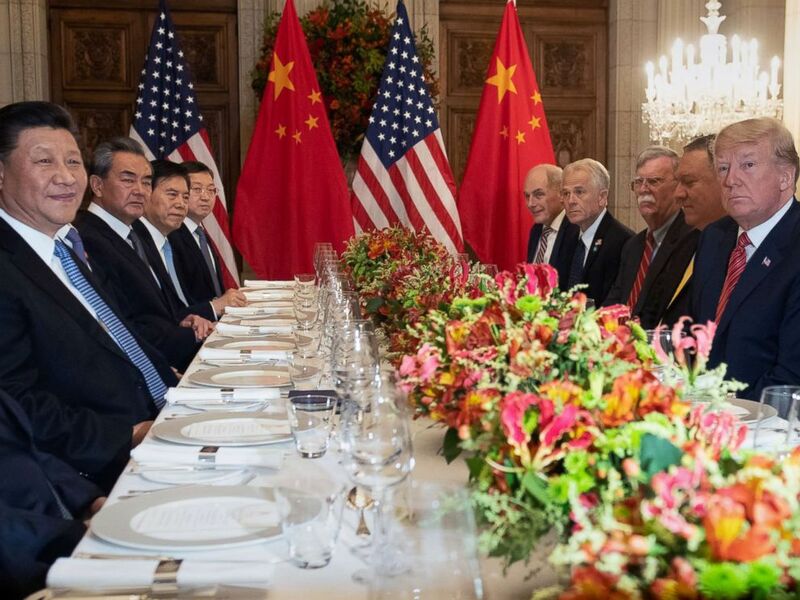 While at the conclusion of Saturday's working dinner, both the U.S. and Chinese delegations said that what amounted to a trade war "truce" between the leaders had been reached, the messaging from the White House that followed seemed to only muddy the waters. The White House on Monday had to correct a statement by economic adviser Larry Kudlow, who incorrectly told reporters in a conference call that the 90-day negotiating period between the U.S. and China would begin on January 1 instead of December 1. But the president clarified the next morning in a tweet that the 90-day period began from the time of his sit-down with Xi. Furthermore, Kudlow seemed to downplay Trump's assertion following the meeting that China agreed to reduce or eliminate its tariffs on American automobiles, telling reporters that there was no "specific" agreement reached. President Donald Trump, right, has dinner with China's President Xi Jinping, left and members of their delegation at the end of the G20 Leaders' Summit in Buenos Aires, Argentina, Dec. 01, 2018. But Trump again sought to paint the talks in a more positive light, highlighting a report from Bloomberg that "Chinese officials have begun preparing to restart imports of U.S. Soybeans & Liquified Natural Gas" that were put on hold as a result of the president's initial tariffs.